Multi-axial (non-crimp) reinforcement fabrics are made up of several plies of parallel fibres, which can be laid in different orientations. The individual layers are then stitched together with a polyester thread to form a single ‘multi-axial reinforcement fabric which can be cut shaped and placed dry into a mould in the exact position needed for the finished part. Being stitched, a multi-axial fabric can be cut to shape and handled without falling apart and it has excellent in-mould drapeability for accurate dry lay-up. Part performance can be accurately designed and optimised by having fibres in different axis. By having uncrimped fibres within a multiaxial fabric enables an even and unrestricted resin flow, with no resin-rich areas, resulting in a higher fibre volume fraction (lower resin consumption). The stitching aiding resin migration through layers which speeds up infusion rates. Using non-crimped fibres results in higher overall mechanical properties of the finished laminate, with a significantly lower risk of delamination. Multi-axial fabrics, especially using tow spreading technology, help reduce fibre print-through. 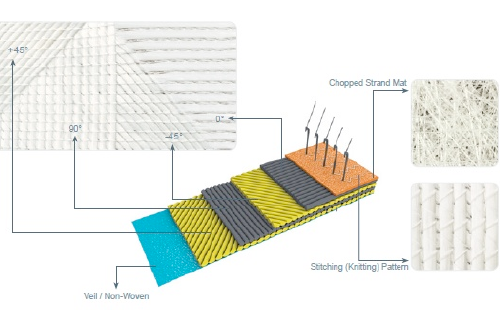 Being stitched, a multi-axial fabric can be cut to shape and handled without falling apart and have excellent in-mould drapeability for accurate dry lay-up.